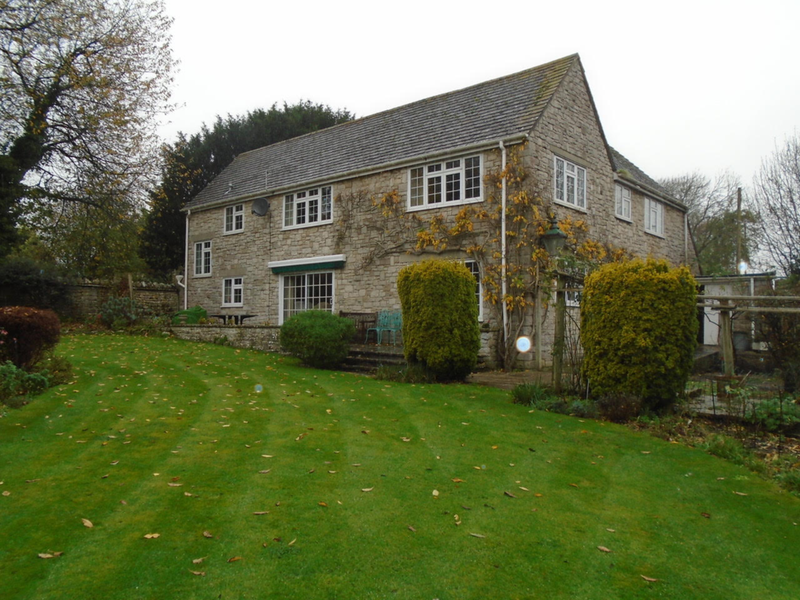 Image of proposed change to house - Orchard Cottage, Corfe Castle, Dorset. Orchard Cottage is not a cottage, but a robust detached house laid out in an L-shaped arrangement, built circa 1970’s and externally faced of stone. It is of a traditional design and as an L-shaped detached house seems large and a little imposing. But its layout is deceptive as it seems large, but only has three bedrooms. It is situated at the bottom of a private road and is not overlooked by any neighbours or roads. Please refer to site photos. There are two ways the house can be entered from the front. There is a formal front door and large hallway on the East side. On the North side there is a door near the garage that leads to the utility room, kitchen and garage. The proposed new shower room is to be located off the formal hallway, which in turn leads to the proposed study that will become the Granny annexe. The other utility door will lead to a proposed lobby with larder, W.C.(with washing machine) and cloak area. From this lobby area a new door is proposed that will lead to the garden, so that access outside can be had via the utility area without taking mud into the kitchen. Access to the upstairs three bedrooms is via the ground floor hallway that leads to an upstairs corridor. Along the stairwell an existing window is located that will be retained and relocated at a higher level. Along the corridor are the three bedrooms with two bathrooms and this corridor wraps around the house on the front side. At its end is a large storeroom accessed via three steps down onto the floor above the low ceiling garage. The proposal is to extend this house at the rear and side. The house has an L-shaped layout and the proposal is to create an extension at the side that creates a gable end on what is presently a sloped roof over the garage. The clients also wish to create a sunroom off a proposed open plan kitchen and dining space at the rear for more informal and family meals and meetings in the kitchen. As an older retired couple the owners would also like to create a new study extension on the rear that will be future proofed, so at a later date it will become a downstairs bedroom with adjacent shower room. These two extensions will be along the South facing rear wall looking onto the garden patio, which is accessed by two sets of glass doors in the sun room and a single set of glass doors from the study. Both extensions have been designed to be symmetrical within the context of the rear elevation and both book-end the patio, which is stepped down to the lawn. The proposed composition is intended to be low lying with flat-topped hipped roofs that lower the impact of the extensions, yet keep a pitched roof to match the existing pitched roof. In both extensions the windows are proportioned to be horizontal and to match the existing. They are both moderately glazed with extensively mullioned windows and French Doors. The sense of openness will allow improved views out onto the garden where the proposed new landscape design will incorporate the new view lines. The mullions of these windows and doors are all to match the existing in combinations of squared proportions. The proposal also includes another sunlight element to brighten this presently dark house. This is for a skylight above the sunroom that creates a feature above the hipped roof. Please refer to the internal perspectives. Upstairs, at the North end of the corridor that faces the front is a large and largely unused storage space under the sloping roof. This roof slopes down from the ridge, which runs along the rest of the house and slopes to below the ceiling of the garage. It is not well proportioned in relation to the rest of the house and creates an impression that the house has been sliced off at the end. The creation of the gable end would facilitate the owners having grandchildren to stay and would create a good-sized room, albeit with a high ceiling. The proposal is to centrally locate an arched feature window that will be tall and will make the high ceilinged space more coherent. In addition to the gable end window, the proposal includes a matching window to be located on the garden side wall. This is positioned to match the composition of the side elevation and will be part of a regular arrangement. The extensions are to be constructed of block work inner leaf and stone to match outer leaf. All the windows are to match the existing, with the exception of the arched window and the skylight. These will be specially made by a joiner and a builder respectively. The roof of the extensions shall be of tiles that will match the existing roof. The new door at the rear side North end shall be timber panelled and framed hardwood construction with a square window of toughened glass. In the middle of the house the clients would like to insert a log-burning stove into the false fireplace and thus the proposal is to also have a matching stone chimney that will house the log burner’s flue. This too is proportioned to match the solid square-ish character of the house and has a modest coping capital. In conclusion, the older owners of this house are still active and wish to use this house as a family place of shared gatherings around the fire, kitchen and dining table. The new extensions will allow children and grandchildren to stay (of which there are many) and also allow better use of the gardens and views. They will also facilitate more convivial spaces and a better functioning kitchen area. Also the extensions will allow the older couple to “stay-put” in their home, when the proposed study space will be converted easily into an accessible bedroom. The gable end will create a feature at the end of what is a slap-dash treatment of the end of the house. It will create a book-end of dignity, which the rest of the house possesses, with its stone and solid appearance. It will also create a great bedroom space for visiting children and guests. The small scale of these modest additions will greatly enhance the house and householders’ lifestyle significantly without making any major impact on the North end or rear elevations. In fact the extensions will create a sense of a smaller scale façade by breaking down what is an unforgiving, undecorated stone façade with mullioned windows and doors and sloping roofs to bring the height down to human scale and soften the overall character. Orchard Cottage prior to development. Proposed design for Orchard Cottage.